On my way to Paducah this year, I planned a visit to Bowling Green Kentucky and the Kentucky Museum at Western Kentucky University. 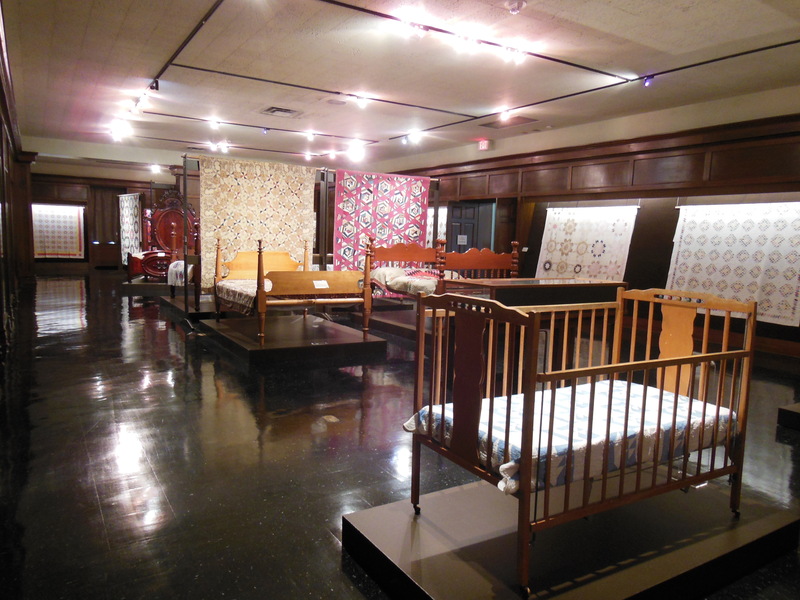 The display of antique quilts is quite wonderful and well worth the stop. These are photos I took during my visit and are posted here with permission. Blazing Sun circa 1855, by Temperence Ely Snodgrass. 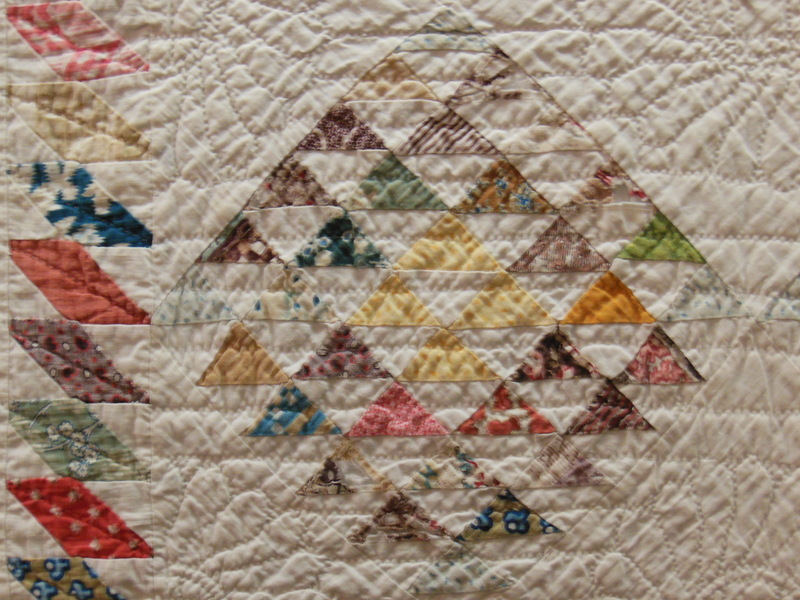 This next quilt, an 1860 Pine Tree variation, is one that captured my attention. I love small pieces and scrappy quilts. 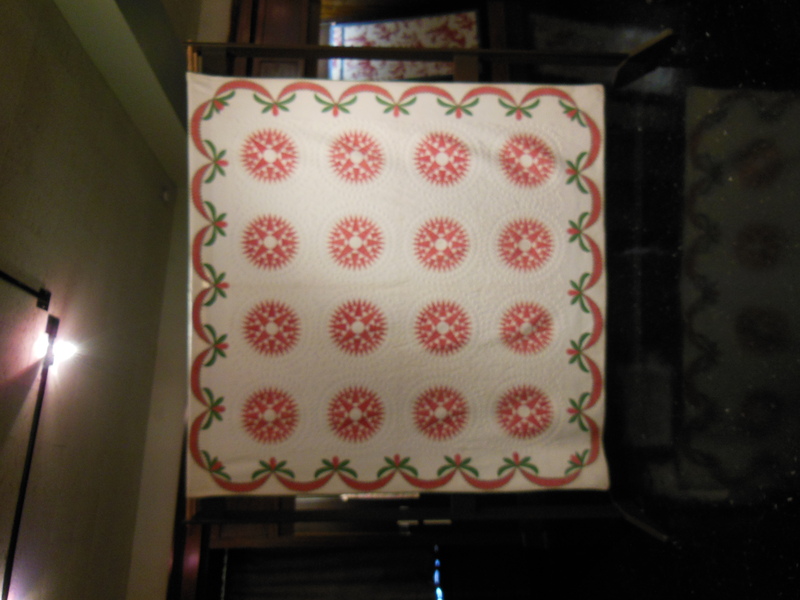 Broderie Perse quilt made from English Chintz by a bride who arrived here in 1800, but never quilted this top. It was eventually tied and a border added in 1875. This baby-sized quilt was made from some bow tie blocks that came to me in a scrap bag. Some of the bow ties were made up already by hand sewing and others were still in pieces. Using my sewing machine, I assembled the pieces to make enough blocks for this little quilt. The blocks are not all exactly the same, but they still look alright. I then added the two borders in coordinating colours. I quilted it on the long arm using Bottom Line in the Bobbin and a light blue So Fine thread on top. 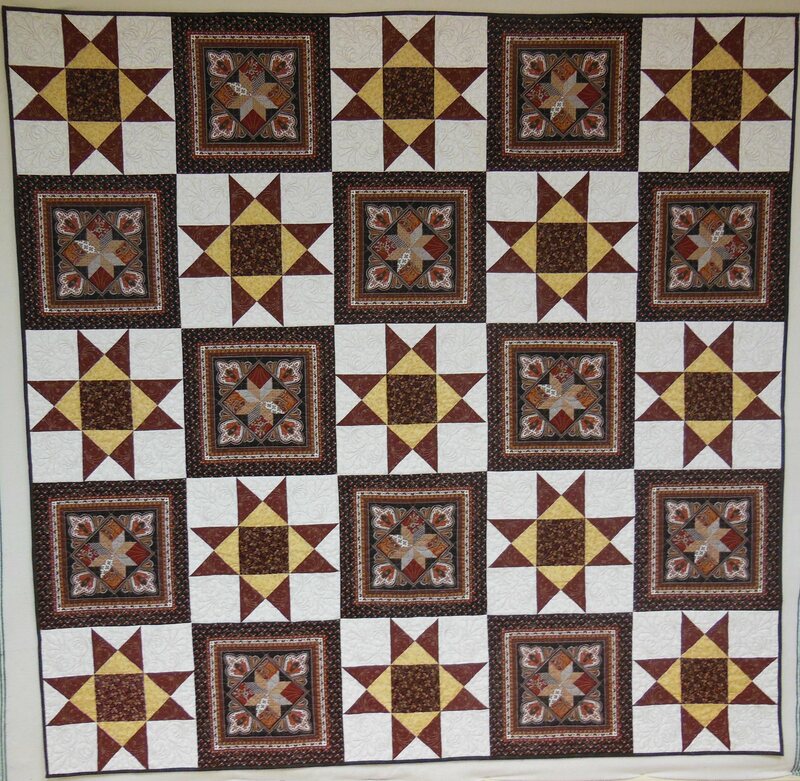 I quilted it in a custom fashion – a block design in each block and separate designs in each border. 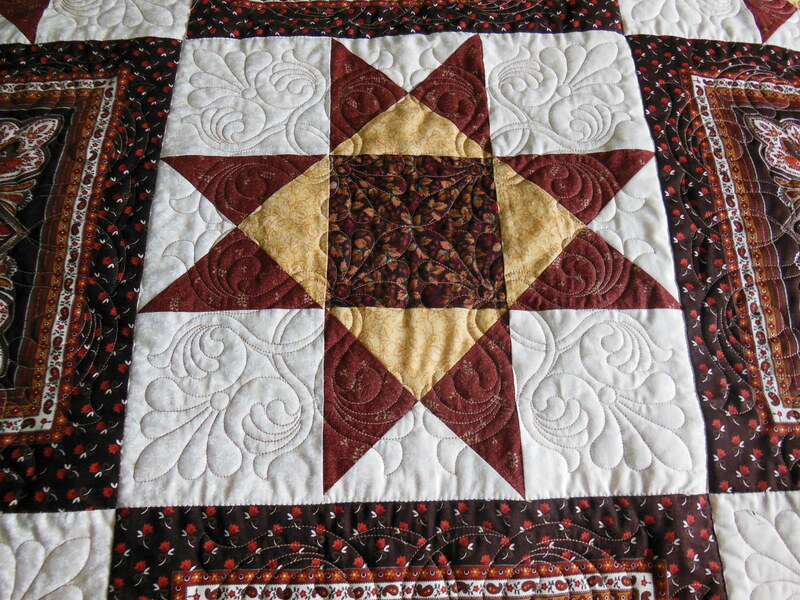 I did not stabilize the quilt around each block and border before quilting. 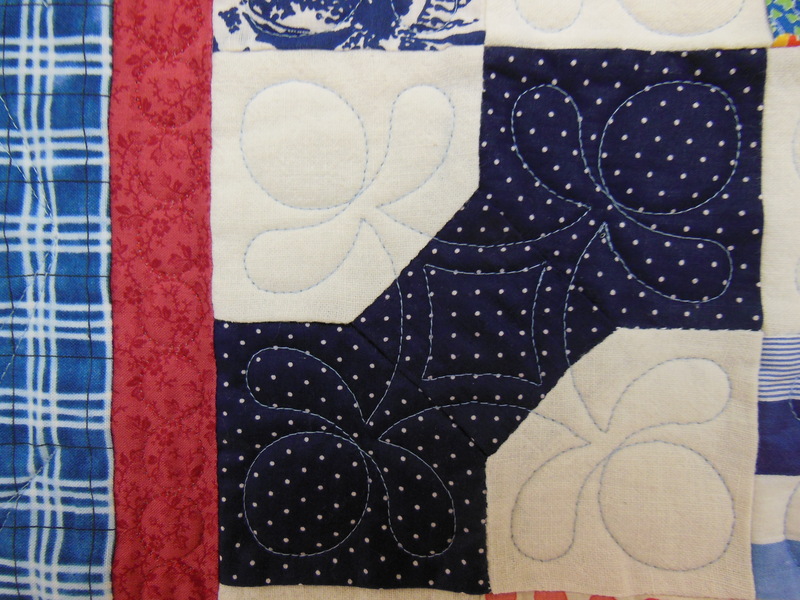 I can definitely tell by the finished result that stabilization would have produced a better looking quilt. That is a good lesson for me. I will stabilize anything that I custom quilt. 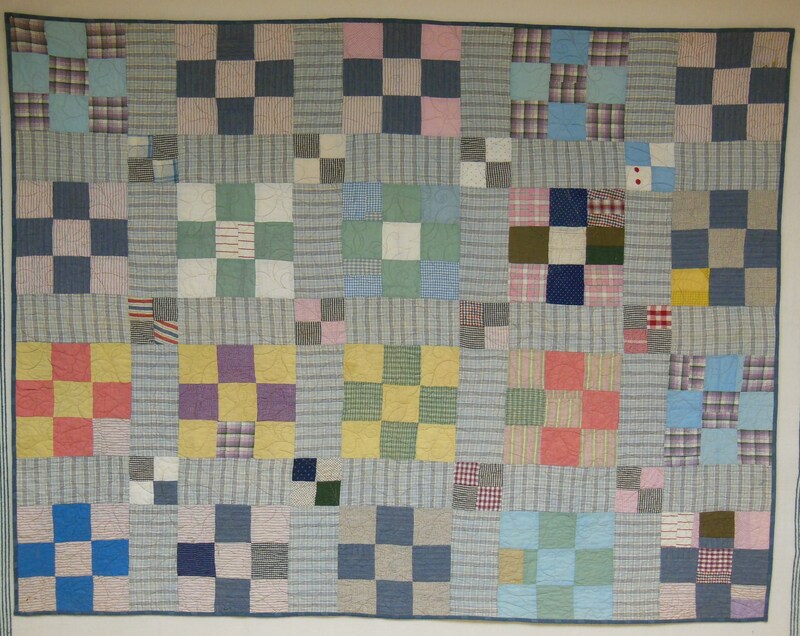 Without stabilization – stitch in the ditch around each block and border – it is difficult to keep the quilt true and square. Even though this does not meet my personal standards of acceptable quilting, I am sure that someone will love it anyway. This will be a donation quilt to a deserving charity. Last week, I went to MQX East in Manchester New Hampshire where I participated in classes, oohed and awwed at the fabulous quilts hung in the show, shopped diligently in the vendor area and thoroughly enjoyed the company of other longarm quilters. 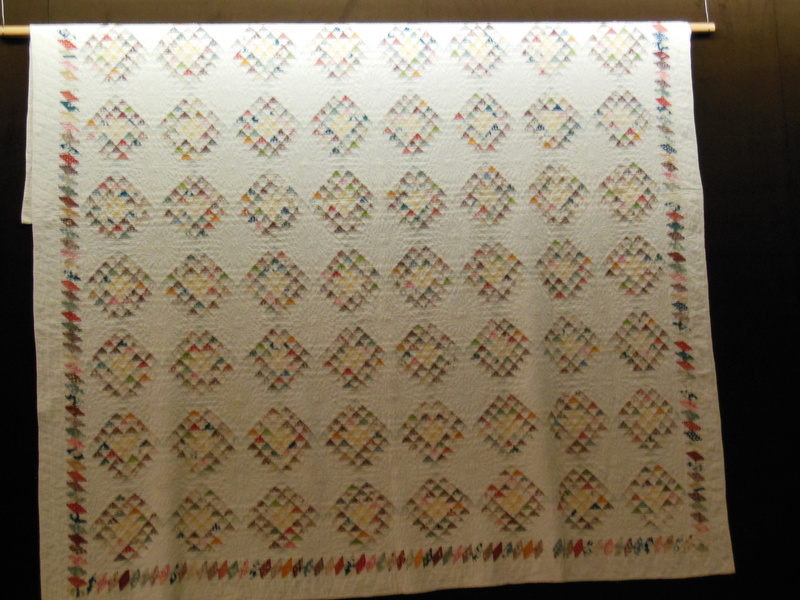 All in all, a wonderful experience that left me pumped with ideas for future quilts. I took classes with Angela Walters, Valerie Schlake, Judy Woodworth and Sally Terry. As the teacher angel at Sally Terry’s hands-on class, I also made a sampler of patterns. The photo above is a freehand filler she taught. We worked on stitch regulated Innova machines with Superior’s OMNI thread. This is one of Sally’s designs – a nesting leaf filler. This design I have been calling a lolly pop filler. 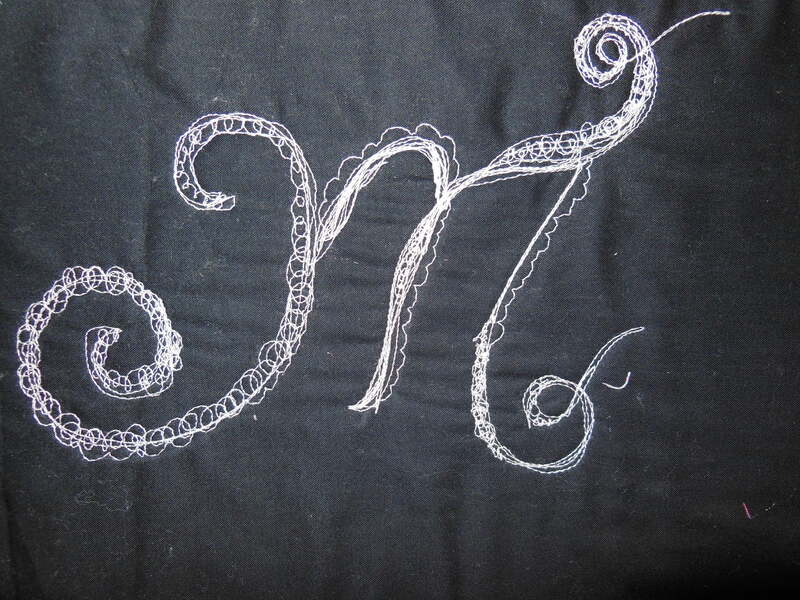 At the end of the class Sally had us tackle two projects – a fanciful fish and a fancy initial. The class was fun and Sally is a good teacher. I’m already planning on going to the show again next year! Two decades or so ago, I bought a partial bolt of pillow panels from at the garage sale of a woman who owned a country decorating store. After ten years of wondering what I would ever do with them, I opted to make coordinating Ohio Star blocks. The finished blocks sat in a drawer for another five years or more. As part of my ongoing efforts to clean up my UFO cupboards, I assembled the blocks into this top. I debated putting borders on it, but finally decided to leave it as a large throw quilt at 76″ by 76″. 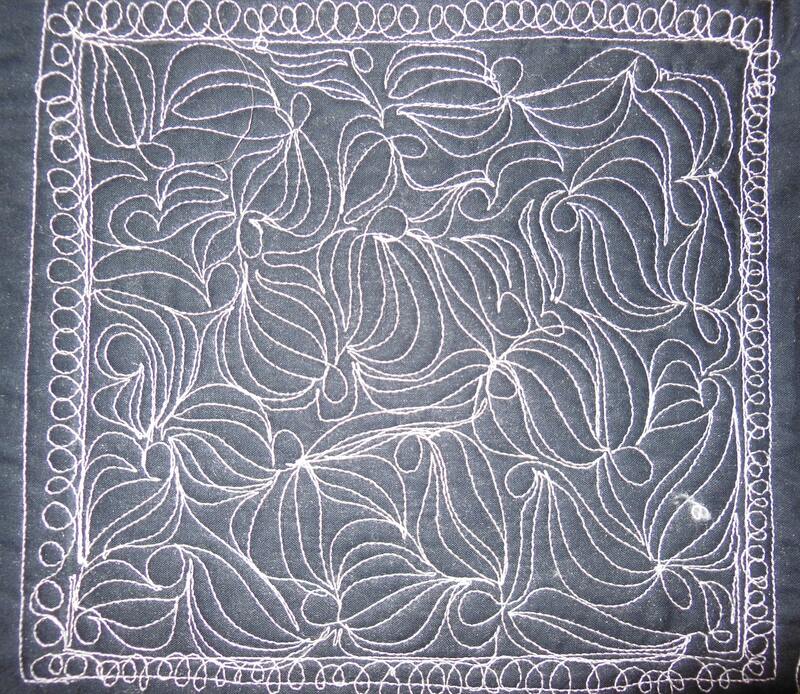 Because the squares look similar to neck kerchiefs, I have named it Bandana Stars. 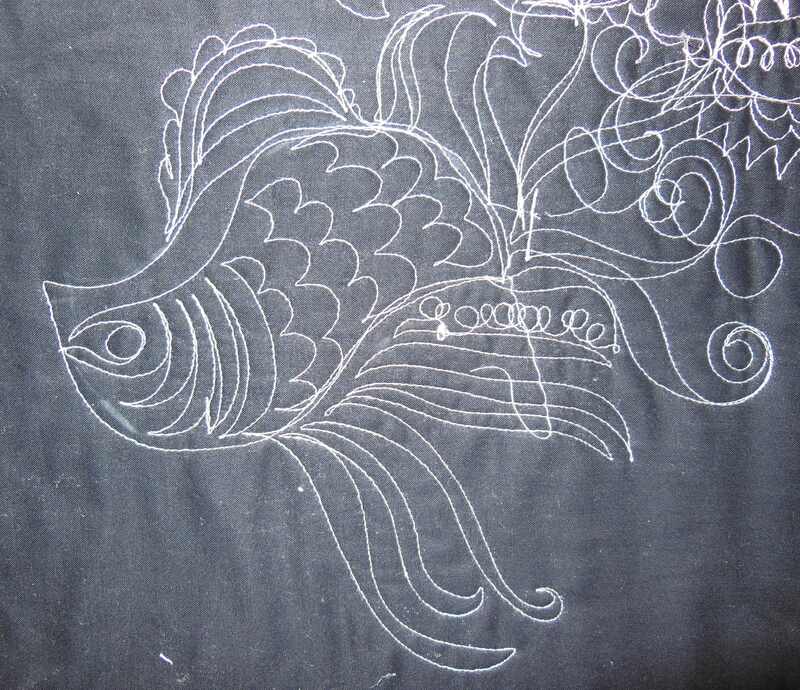 Several years ago when I was busy with work related travel, I had little time for piecing tops. I got the bright idea to purchase tops on eBay so I could quilt them as I had time. It sounds good in theory, but the reality is quite different. I purchased a dozen tops, but the quality of the fabric and condition of the tops left a bit to be desired. When I opened the packages, I was somewhat dismayed by my impulsive and imprudent purchases. Chagrined, I stuffed them into a cupboard for several years, but since my retirement, I have forced myself to bring them out of hiding and quilt them. 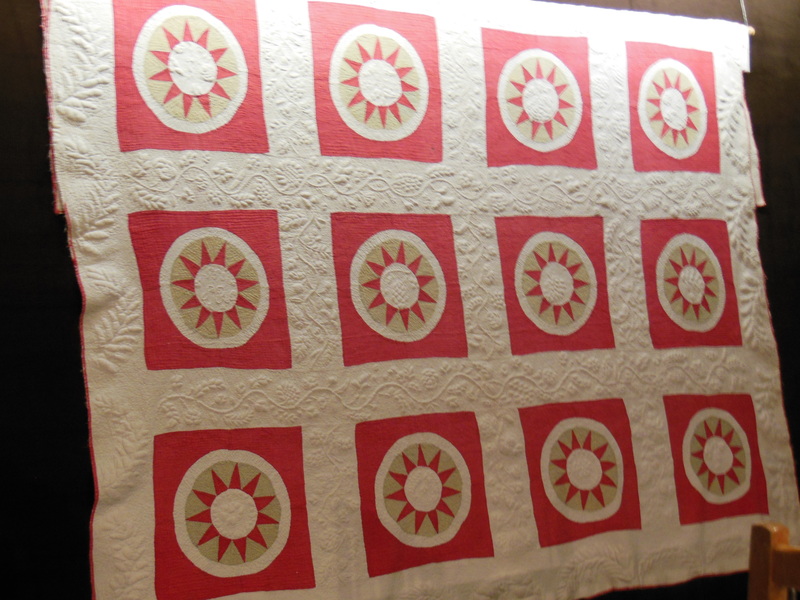 This vintage nine patch quilt is one of those infamous e-Bay flimsies. The vintage cotton top is hand pieced and showed evidence of unprotected storage in an attic where little four footed creatures scurry. Sigh! 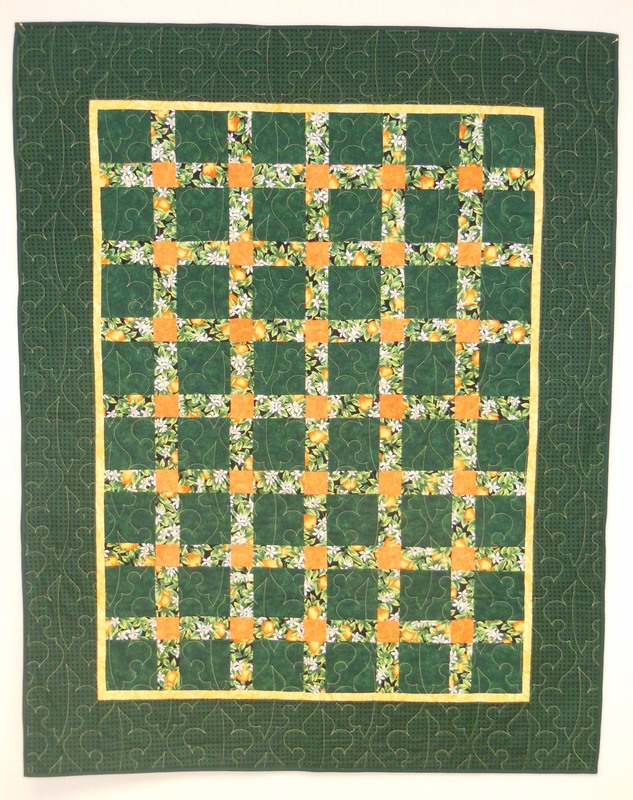 I prepared a backing of a greenish grey shirting and quilted it with a tan thread in a pattern called Pretty Posie, designed by Tammy Finkler, which suited the old fashioned nature of the quilt. The batting is Warm and Natural – 100% cotton. 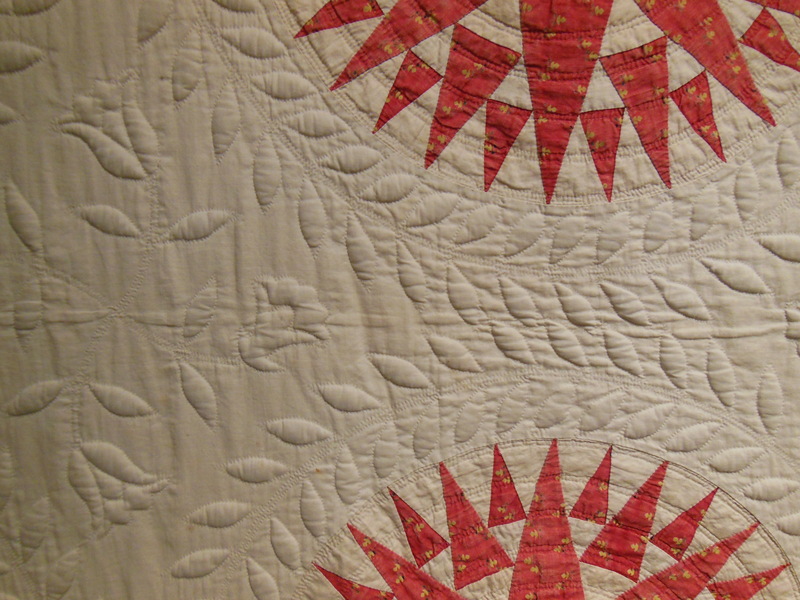 Once quilted, I soak-washed the quilt, using a healthy dose of Fantastic on the stains on the top. After a good rinse, I dried it in the dryer. It came out soft and puckered, like a well-worn old quilt. 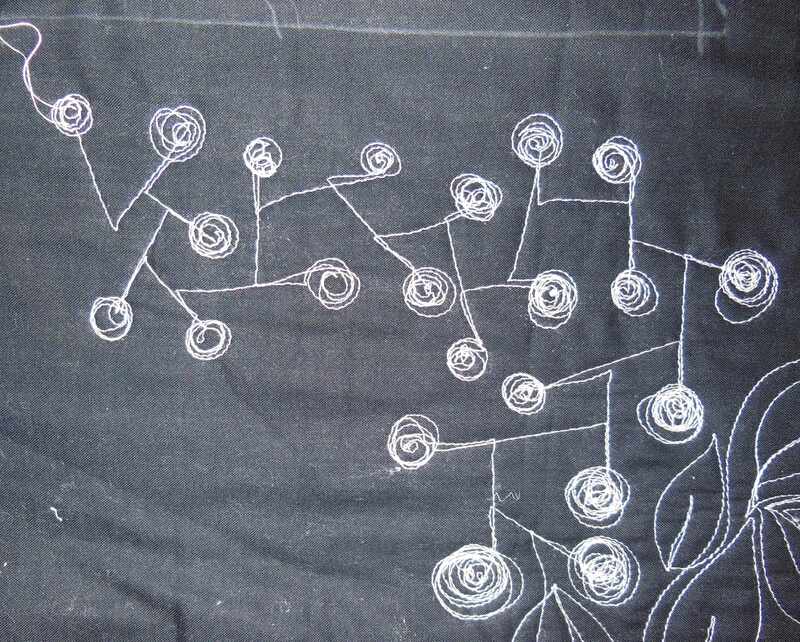 I then bound the quilt with a slate blue cotton shirting. I’m quite pleased with the final result. The stains are mostly gone and it looks like a well loved vintage quilt. My son has asked me not to give it away and I have agreed. This quilt will find a home at our summer cottage where it will be a great snuggle quilt for cool summer evenings on the screened-in porch. Now I am sorry I left this top hidden in a cupboard for so many years! 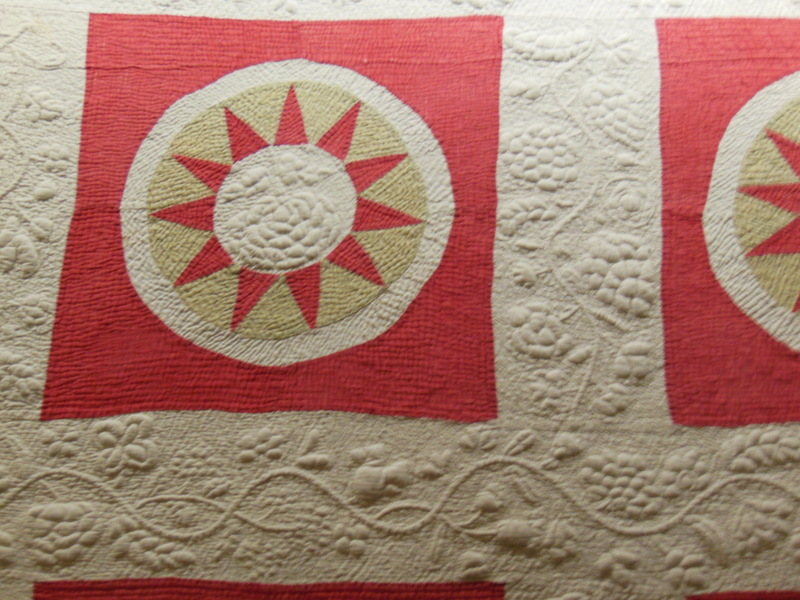 This lap quilt is named for the printed sashing. The fruit print makes me think of Oranges and Lemons, a piano piece I learned when I was a child. I think the fruit might actually be peaches, but my mind only reads oranges and lemons. I made this lap quilt as a challenge to use these printed scraps given to me by a friend. I made disappearing nine patch blocks and then decided I did not like the arrangement. So I then made an extra row of sashed squares to turn the full quilt into sashed blocks. I then added the narrow inner yellow border and the wide green outer border. If I were to do it over, I would choose to make the yellow border narrower, to tone down the power of the yellow. I quilted it with a bright yellow poly thread with Bottom Line in the bobbin. 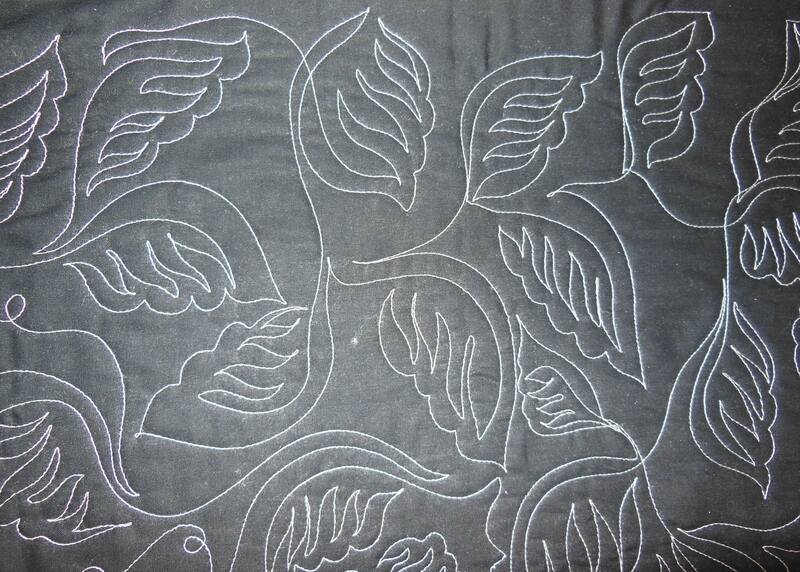 The quilting design is called Insignia. I cannot recall the name of the designer. 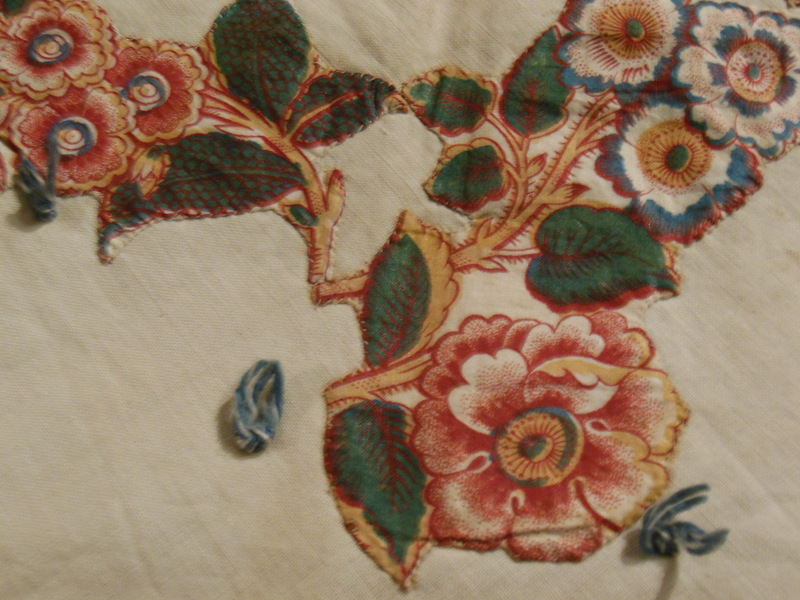 The binding is applied to the front by machine and hand stitched to the back. The binding has been an ongoing hand stitching project for at least a month. Thank heavens, I have guild meetings when I can sit and stitch. 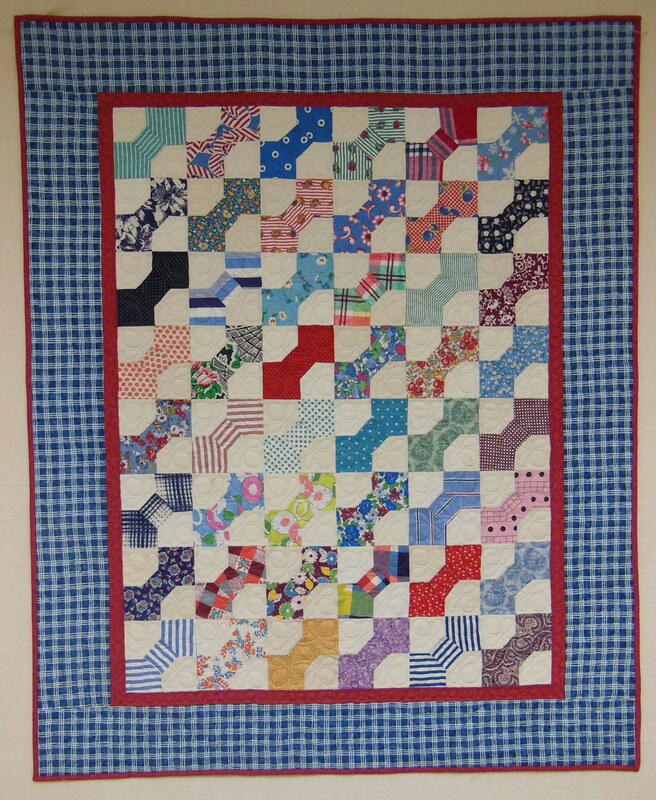 The finished quilt will go into my stash ready to be given away when I am inspired by the right occasion.